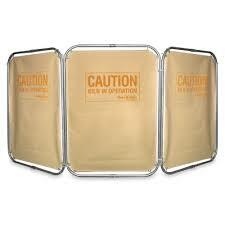 Designed to keep kiln area clear and protect students and employees from possible injury when kiln is in operation. To create a highly visible warning, the screen is imprinted with the words “CAUTION KILN IN OPERATION” in yellow print. Made with fire retardant canvas curtains and sturdy aluminum tubing frames, each panel measures 2′ x 3′. Three panels are included in a set. Additional panels may be purchased to cover larger areas. Shipped unassembled, all necessary parts are included for assembly.